Propella’s CRM development is a tight integration with the Propella ERP system. This means that the data structures are developed within the existing database and are therefore readily available to use or be shared with all other modules. There is no need for an export into a CRM sub-system or the synchronisation between two sets of information. An example of this is the storing of contact and customer information which is held in just one place and therefore avoids any double entry or matching with a separate contact database. 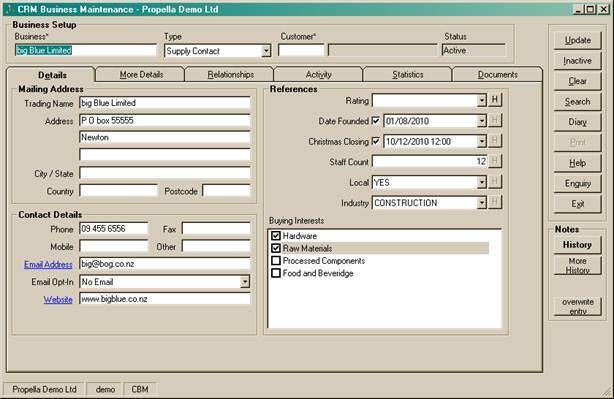 Prospects and opportunities tracked through the CRM module have information already loaded when it comes time to turn them into a customer and accept a quotation as a sales order. Memos, emails, documents and phone calls can all be linked and tracked with your service orders, quotes, sales orders and purchase orders. A Propella icon in Outlook lets you choose which incoming and outgoing emails are saved against the transaction. Although the definition of CRM is ‘customer relationship management’, Propella’s development extends this to general relationship management where contacts and entities (or businesses) can be held for all of the relationships you may have. These may include suppliers, professional organisations and industry prime movers.